A Remarkable CD by an amazing Band! Learn all about the Wondrous Handy CD today! It is easy Just clickit right here! A CD with all of the spectrum of moods of the musical palette going way beyond eclectic and a few pages further than simply innovative. As the CD spins you will find the moods and spirits gathered together in the room pleasingly satisfied and cured of whatever ails them A wonderful journey through many places and spaces orchestrated within a energetic, unifying style highlighted with excellence and enthusiasm. This recording is tempered by a clever understanding of the complex dynamics of any listening audience. The band makes clever use of transition, interlude and introduction as it goes from place to place within the musical minds of a diverse audience. The Songs and tunes and styles are designed to please a diverse audience. Skilful transitions smooth the path while interludes share the space with the assembled multitude of diverse listeners. In the list below I refer to styles broadly. The expert mastery of style and tradition is one thing accomplished here. The second is a personalization of that style through adaptation and enthusiasm. This takes the listener well beyond style as narrowly defined into new work. Ted Porter: vocals, mandolin, banjo-mandolin, wooden flute, bombard, dohkla, frame drum, trash set, marracas. Be Cubed- A brassy polyphonic introduction as if composed by a collaboration of Kurt Weill and Gabrelli- a people's magnificent entry. This entrance lays out the textures of the experience to come. Stranger- The scene gently shifts to a prayer gathering around a campfire in the Australian out back. You can sort of hear the billy boiling and the Koala bear munching on a Eucalyptus leaf. The Bushwackers here provide a thoughtful song spiritual in a style which reflects a mastery of Australian folk music such as that of the Ragged Band. Yet....it is still quite their own. Click here for an mp3 exerpt! I Don't Care- The free spirit of the crowd is suddenly unleashed. Where there are children we find the adults singing it to them where there are only adults one is suddenly in a room full of children. A wonderful song about getting along and a mastery of the Children's song as typified by groups like Hot Soup. The high energy of the Bushwackers has no equal. Swallowtail Jig and the Rakes of Kildare- A wonderful interlude. An opportunity for conversations and a filling of glasses....make mine Guinness! I have never heard Celtic music be played any better. This is a refreshing indicator of wonder for a band that plays in many styles. Full of energy yet precision and excellence. Never sloppy, always crisp and clear. The Bushwackers have convinced me though, that....More Irish Bands really do need to have tubas! Hound Dog- A piece of Americana which brings out spirit and fun. Again the child in us all will light up the glasses will be raised and all will join in with a song that most will know and relate to. If there is not singing there will be joy transferred by eye contact all around the room and of course foot tapping,clapping and swaying may very well occur! Landlord- Every gathering needs at least one Calypsonian and this interlude is it. This is a didgi Calypso experience. A mastery of the genre combined with a unique texture of sounds conveyed in the highly emotive style as is common to the spirit of the Calypsonian. You are not just hearing Calypso you are becoming Calypso. Another degree of relaxation and inspiration. Listen via real audio clicket right here. Money Song- Has Tubby Checker entered the room....well not very Elvis but a spirited interlude of screaming sax highlighted rock and roll. Clever lyrics and a great hopping tuba part. And the room rocks...Cha...Cha...Cha! Blow Below the Blow- Somehow I feel a procession starting .A plane like excursion into windblown possibilities as everyone processes around the house. The wonder develops. A contemplative interlude. Smallpipes skillfully articulate a mysterious chant. The electricity of the didge like lightening energizes the clouds of incense. Spirit of Christmas- At the end of our procession we all gather at a simple stage whereupon a medieval peasant sings out of the universality of the spirit of Christmas. A great folk inspired piece which touches the heart and could well become a seasonal classic. Whistle, Didge and tuba make it echo through the ages. It could be a classic for the whole year too. Raunon Valssi- We move into the Nordic woods which is invoked in sublime majesty in this abstract interlude of discovery, dance and chase. A powerful didge entrance is followed by wonderful folk accordion. Dogs bark in the background all dervishly whirl around as the piece ends with the didge triumphant. Listen to this in real audio clickit right here. Muriel C. Begonia- A berserk crazy mastery of the "a-ha"-capella. The Bushwackers get everyone rocking. Great use of stereo. They are all around the room singing over your shoulder . She's more than half way there I say! I see everyone in the room shaking each other up with sheer chaos on their minds. La Porte en Arrier- Some folks can perform Cajun but others....kick it up another notch! Yeah baby! One expects to see Emerl Lagasse come out of a corner of the room with a great pot of creole gumbo. And the tuba bubbling up through it. Bam! This is a great example of how the Bushwackers are able to master a genre and then add their own spirit and feeling. All of the textures the Cajun experience. 16 Is it a big fly, a bee or a plane? As the party winds down the didge takes off in a flight of fancy. The mind wanders explores and awaits the secrets of sound. Where were you-The didge continues the journey until all are engulfed in the rich majesty of this most ancient of tribal instruments. As grand a polyphonic didge piece as the brass selection which began this wonderful experience. Truly a virtuoso piece. 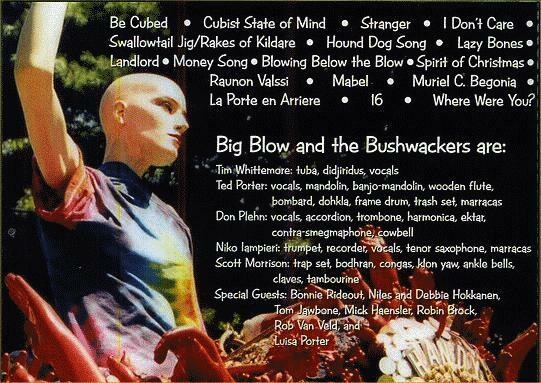 You can also obtain the CD direct from the Big Blow and the Bushwackers. Same cost etc. They may be able to accept credit cards. Click here to go to their official page. You can purchase this cd on line-click here! 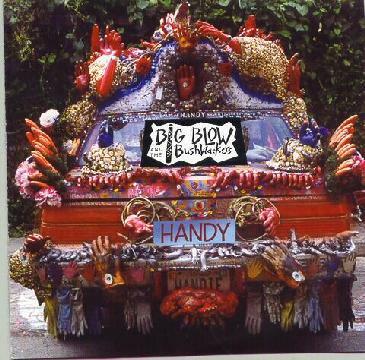 (Don't delay...I hear they have this important new cd called HANDY out and they will be in great demand!) Be sure to scroll down to see Handria! Even Handria is on the CD!